Napoleon and Davout, «the World's Soul» and the «Iron Marshal», came together on 14 October, 1806, for the crushing double-battle victory Jena-Auerstedt which annihilated the Prussian army. After Napoleon’s victory over the combined armies of Russia and Austria at Austerlitz, on the 2nd of December, 1805, the face of Europe was radically altered. France had occupied Italy and the southern German Länder, a potential source of future wars, against the advice of Talleyrand, Minister for Foreign Affairs. However, against all odds, a new hope had sprung after the treaty of peace at Pressburg, signed on the 26th of December 1805. The ceding of Hanover to Prussia seemed to ensure warmer relations between France and Prussia. But hopes of a lasting peace were soon disappointed. The negociations failed in May 1806. The Prussian ultimatum on the 26th of August 1806, demanding that Napoleon withdraw his troops behind the Rhine before the 8th of October finally obliged him to act. It was in thick fog that the first French assault at Jena began, at 6 am on the 14th of October. Some 240,000 French, Prussian and Saxon soldiers affronted each other on the two battlefields of Jena and Auerstadt. 150,000 soldiers fought on the battlefield of Jena, on a terrain measuring 6km by 12km, and 100,000 of them were directly engaged. At Auerstadt, 65,000 of the 85,000 soldiers present were engaged. Two Prussian reserve divisions were unable to take part in the fighting. When the Duke of Brunswick, commander-in-chief of the Prussian army, was severely wounded in the head, the King of Prussia vascillated and did not appoint a replacement. The Prussians split up in a series of disorganised skirmishes. At the end of the day, the French were victorious on both battlefields. Between 30,000 and 35,000 dead and wounded lay on the battlefields, a number that we can only fully appreciate in the knowledge that the population of Jena in 1806 numbered around 4,500 inhabitants. We know almost nothing of the unheard suffering of towns and villages in the path of armies. The battlefield of 1806 has remained a tourist site, as have the nearby towns of Weimar, Apolda, Naumburg, Erfurt (the capital of Thuringia) and Eisenberg. We suggest to you here three routes through the region in and around Jena, The Battle of Jena, the Battle of Auerstedt and the Napoleon Route, not to mention Napoleonic Continuations including Weimar and Erfurt. Enjoy your visit. This itinerary was created in parthership with Jena Tourist Office. This route begins at the Napoleonstein or (Napoleon Stone) which is about 400 metres away from the Cospeda 1806 museum on the highest point of the Landgrafenberg, the “Windknollen”. From here, you can discover an impressive panoramic view of Jena and the Saale valley. This place originally harboured a small pillar that marked the frontier between Jena and Cospeda. It was just under the Windknollen that Napoleon spent the night with his troops. He arrived in Jena in the afternoon of the 13th of October and immediately mounted the Landgrafenberg, held by French troops. It was there that he indicated to his commanders the positions that they were to occupy during the battle on the next day. After the battle, the Emperor spent the nuit in the castle (which is now the main building of the University), and on the 15th of October, he arrived in Weimar. Moreover, Napoleon was to pass over the Landgrafenberg again in 1808, during the Conference at Erfurt with the Tsar Alexander I of Russia. It was there that he promised a university delegation from Jena that he would pay compensation for the damage suffered by the inhabitants of the town during the fighting. Ever since, the frontier stone bears the name “Napoleonstein”, or “Napoleon’s Stone” After the Second World War, the terrain was used by the Soviet Army and was inaccessible to the public. The monument was lost during this period, and relaced by a new stone in 1991. The route continues a further 400 metres to the next stage, the 1806 Jena /Cospeda Museum, the best place to start if you want to get clear idea of the events which occurred two hundred years ago. Apart from the artefacts related to the story of the battle and the war of 1806/1807, the museum offers detailed maps and paintings, dioramas and contemporary eye-witness accounts. Visitors are not only informed on the causes of the war, the course of operations and the consequences of the battle, but can also find information on the burden of war that the inhabitants had to bear. Other aspects treated include the everyday life of soldiers on both sides, their uniforms and the workings and effects of the weapons of the period. The next stage in the itinerary is a visit to the important sites related to the battle and the monuments related to it. This part is arranged in chronological order as the battle unfolded. At each site there are panels explaining what happened and visitors have the same view of the battlefield as did the commanders, officers and soldiers whose stories are told on the panels. Situated between Krippendorf and Closewitz, the Dornberg marks the highest point of the battlefield of Jena. From here, it was possible to take in the entire battlefield when looking out to the North and West. Napoleon was fully aware of the enormous strategic advantage offered by the Dornberg, and concentrated all possible efforts on its conquest as soon as battle was engaged at Jena. During the night, French troops occupied the Landgrafenberg with all their equipment – a truly monumental feat of logistics, particuliarly given the difficulty of transporting cannon in unforgiving terrain. The Emperor himself participated, intervening at one point to iron out a traffic jam and to ensure the fluidity of the path onto the heights. On the 14th of October, at 6am, the French attacked the Prussian and Saxon troops holding the Dornberg under the command of General Tauentzien. At first, Tauentzien’s forces held out, but more and more French soldiers pressed in on the Dornberg, via the Cospeda heights, taking advantage of a thick fog. Around 9am, Tauentzien began to retreat toward Isserstadt/Vierzehnheiligen, under the weight of numbers and hoping desperately for help that did not arrive. Napoleon had achieved his aim. From the Dornberg, he could direct the course of operations. Shortly after, French, Saxon and Prussian troops collided near the village of Rödigen. On the eve of the fighting, General Holtzendorf had taken up lodgings there, and divided his soldiers between several villages. This geographical separation was to prove to be a serious handicap when battle was engaged. It was with great difficulty that Holtzendorf was able to concentrate his forces. Around 10am the Prussian lines stretched between Rödigen and Lehesten. Holtzendorf was soon forced to retreat toward Apolda, opening the way for the French, who fell upon the left wing of the Prussian and Saxon army near Krippendorf. The battle had now entered a decisive phase. The Bissing monument sits between the hamlets of Rödingen and Lehesten. It commemorates the story of a Saxon First Lieutenant August Von Bissing who was killed in the fighting around Rödingen. After seizing the Dornberg, Napoleon could see that a large part of the Prussian and Saxon army had taken up position in the plain behind pouvait Vierzehnheiligen. Soon after, this small town, known for its medieval church, was in the heart of the fighting. Around 10am, the lines around the town were aflame. At first the Prussians, under the command of Prince Von Hohenlohe-Ingelfingen, were able to hold off the French attacks. But it was at this moment that the prince made a monumental mistake. He deployed his troops in a thin line, linking Isserstadt, Vierzehnheiligen and Krippendorf, without occupying the villages and without making use of the cavalry at his disposal. Instead, his soldiers had to withstand two hours of withering fire from French sharpshooters, who were able to use the villages for cover and to fire at leisure on the enemy lines. Meanwhile, Napoleon had ordered reinforcements from the Dornberg, who inflicted heavy losses on the Prussians and Saxons. French cavalry charging from Rödigen had also begun smashing through the defenses on the left wing of the Prussian army. Around 1pm, the carnage was terrible, and the Prussian lines began to disintegrate. There was little sight of the famous Prussian discipline beaten into the men. Whole regiments of the Prussian and Saxon army turned and fled. The battle of Jena was turning into a rout. From here, the old Krippendorf windmill is just visible far away to the North of Krippendorf. During the fighting, the soldiers used it as a landmark. Today, the area around the mill is beautiful. The fields roll away as far as the eye can see, and it is difficult to imagine the horrific carnage that took place here 200 years ago. The only reminder of the bloodshed is a narrow path between Vierzehnheiligen and Krippendorf, edged with cherry trees. The “Europe Route” marks the Prussian positions during the fighting around Vierzehnheiligen. The soldiers were forced to remain “planted” shoulder to shoulder, like the trees that stand here today. The Eberhard Monument commemorates the death of the commander of the Grawert Infantry Regiment (the 47th), Major Von Eberhard. It was raised by one of his descendants and sits on Europe Way. The “Europe Way” project was launched in 2003 by the “Lebensraum Gönnatal e. V” association and symbolises the transition from hereditary enmities to a united Europe. Duirng the course of the past few years, the association, with the support of diverse partners, has installed panels along the way bearing quotations and planted trees in whose shade walkers can immerse themselves in the history of this place. In 1806, the hamlet of Vierzehnheiligen found itself in the heart of the battle of Jena. A monument near the village church, designed by Prof.Max Unger of Berlin, was inaugurated on the 14th of October 1906 for the 100th anniversary of the battle. It commemorates the fallen and a bronze plaque bears the names of 53 Prussian officers. As the fighting reached its climax, a division of Saxon troops watched the course of the battle from a hill outside the Mühltal of Jena, in a place known as the «Schnecke», near Vierzehnheiligen. Those who come to Jena today from Weimar cross the Mühtal with many turns in the road after Isserstadt. In 1806, unlike today, the hill was not yet wooded. The hills around offered a good view of the battlefield near Vierzehnheiligen. Here, the Saxons awaited the orders of the Prussian commander in chief, the Prince Hohenlohe-Ingelfingen, who did not arrive. They received no information regarding the course of operations and were not called in as reinforcements. They therefore decided to wait, sheltered in the Mühtal, waiting for the French attacks, which were, at first, far away. It was not until around 1pm, when the French had already crushed the Prussian and Saxon forces around Vierzehnheiligen, that fighting began at the Schnecke, between the Saxon troops holding the position and units from Marshal Augereau’s corps. By shortly after 14h30, the French were victorious in this sector. Part of the Saxon division was taken prisoner. The rest fled. The final chapter of the battle of Jena was written by the fighting around the Sperlingsberg, near Kapellendorf. On the 12th of October, the Prince of Hohenlohe-Ingelfingen had set up his headquarters in the castle of this small town. After the defeat at Vierzehnheiligen, a large part of the Prussian and Saxon Army sought refuge at Kappellendorf, intending to join with the forces of General Rüchel, whom Hohenlohe-Ingelfingen had called on for help only a few hous before. The general’s attempts to integrate the fleeing troops into his forces in order to create reinforcements failed. Despite the odds, he lauched a counter-attack at about 2pm with fresh troops, uphill, inot knowing the strength of the French forces in front of him. Rüchel’s offensive failed in the face of French artillery. In less than 30 minutes, his 15,000 men were defeated and forced into retreat. The imposing Kappellendorf castle sits in the triangle formed between Apolda, Jena and Weimar. The castle, built in the middle of the XIIth century, boasts a turbulent history. From the 12th to 14th of Octobre 1806, it housed the headquarters of the Prussian and Saxon army commanded by the Prince of Hohenlohe-Ingelfingen. Not far from the castle, a commemorative tower on the Sperlingsberg recalls the final actions of the battle of Jena. The castle houses a painting by F.L.Schuster “The Saxon battalion ‘aus dem Winkel’ at the battle of Jena”. Near the castle stand two monuments, “Aus dem Winkel” and the Sperlingsberg. The monument “Aus dem Winkel” is dedicated to the Saxon battalion and to their eponymous commander, Julius Heinrich aus dem Winkel. It stands in the fields between Hohlstedt et Kappellendorf. To reach it, take the public path between Hohlstedt and Kappellendorf. The second monument is a limestone tower, twelve metres high, inaugurated on the 14th of October 1906 on the Sperlingsberg, a hill to the East of Kappellendorf. The tower is dedicated to the fallen in Rüchel’s army, defeated here at the end of the battle of Jena. From the top, visitors can take in a breath-taking panoramic view, stretching from the Weimarer Land to Ettersberg. The second route takes us to the site and context for the Battle of Auerstedt, brilliantly won by Marshal Louis-Nicolas Davout (1770-1823), known to his men as “the iron marshal’. It begins at the Gedenkstätte Hassenhausen commemorative monument. It was at Hassenhausen that the main body of the Prussian army, commanded by the Duke of Brunswick, and a corps of the French army under Marshal Davout, collided. During the day, the « scrapping » between small groups and platoons rapidly turned into a battlefield covered with dead and wounded. The place of commemoration not only presents the events that preceded the fighting but also the suffering of those hit by the war, civilians as well as soldiers. Objects found on the battlefield and weapons of the period complete this exhibition, while a large diorama of lead figurines maps out the field and the combats that took place upon it. Then comes the principal monument at Hassenhausen. It is similar to that erected at Vierzehnheiligen and was placed in front of the old presbytery. Further to the west, situated on the B 87 between Taugwitz and Hassenhausen, stands the commemorative monument to the Duke of Brunswick, commander-in-chief of the main body of the Prussian Army, who was mortally wounded at the onset of the battle of Auerstadt, while leading a division of reinforcements that had just arrived on the battlefield. Galloping at the head of his troops, he came too close to French sharpshooters and a bullet struck through his left eye. The wound had serious consequences for the rest of the battle, as from this point onwards, there was no real coordination in the Prussian forces and the French forces were able to impose themselves, despite being confronted by an enemy much stronger in numbers. The Duke died three weeks later from his wound. The monument was inaugurated in April 1808 on the cemetery at Taugwitz at the request of Karl August, Duke of Weimar. In 1815, the monument was moved to mark the area in which the Duke of Brunswick was wounded. Location: B 87 between Taugwitz and Hassenhausen. A former military road leads from Auerstadt to the hill at Gemstedt on the B 87. Once at the summit, you can appreciate the landscape, the reason that the area is also known as the « Tuscany of the East ». Fields as far as the eye can see, gentle hills and wildlife. From here, visitors can profit from the best panoramic view of the battlefield of Auerstadt. It was here, around 9am, that the main body of the Prussian army, commanded by the Duke of Brunswick, engaged with the IIIrd Corps of the Grande Armée, under the orders of Marshal Davout. Davout (whose hat was « removed » by a cannonball) managed to take advantage of the duke’s wound and the ensuing disorder impose his will on the Prussian army. In the afternoon, the King of Prussia, Frederick-William II, inexperienced and indecisive, ordered his troops to turn around and march toward Weimar (in order to reinforce their comrades at Jena). It was only on the march that he learned of the resounding defeat of Hohenlohe and Rüchel at Jena, by which time it was no longer possible to change the course of events. Consequently, Prussia had therefore also been defeated at Auerstedt. Surprised by the size of his marshal’s victory, Napoleon initially disbelieved reports and was perhaps slightly jealous, although this soon passed and he gave warm recognition of Davout’s talents. “Your general, who normally cannot see much (Davout often wore glasse) has today seen double”, said the emperor to one of Davout’s staff officers who had come at 9 am the following day to announce the victory to the emperor. On 16 October, at 7am, the emperor wrote to the marshal as follows: “My cousin, I pay you my warmest compliments, with all my heart, for your fine conduct. I mourn the brave men you have lost: but they died on the field of honour. Communicate to your corps and your generals my satisfaction. They have won forever my esteem and recognition. Send me your news and have your army rest a while at Naumburg.” In the 5th Bulletin of the Grande Armée relative to the battle of Jena/Auerstedt (written on the 15th and published in the Moniteur on 23rd) Napoleon wrote: “Davout’s corps worked miracles; not only did it contain but it victoriously drove back three leagues the main body of the enemy, which should have debouched along the Koesen. This marshal has displayed outstanding bravery and strength of character, the primary quality in a man of war”. In recognition of the crucial role played by the commander of the IIIrd Corps, he was given the honour of entering Berlin first, on 23 October, and awarded the title of Duke of Auerstedt. At the hamlet “Ziegelstein”, route between Hassenhausen and Großheringen B 87 between Gernstedt and Eckartsberga, fork Alte Heerstrasse (Bettelfrau) in the direction of Auerstedt. The visit continues to the south west in the direction of Auerstedt, where next port of call is the Auerstedt Castle Museum. This small museum occupies the first floor of the castle of Auerstedt that housed the Prussian king’s headquarters on the eve of the battle. Vistors can admire a diorama representing the falling in of the Prussian troops, the Duke of Brunswick room and the Marshal Davout room which contains a vast exhibition of artefacts. The museum is managed by the Heimat- und Traditionsverein Auerstadt e.V. Also worth seeing is the Weimar Classical Foundation collection of carriages at the Weimar Carriage Museum. The sumptuous carriages give an eloquent vision of luxury and mobility of a time when the world was dominated by horses. There is even “Napoleon’s carriage”, but he never used it because it reminded him of a skull! We end this route heading south-east (to the north of Jena) with a visit to the Neuengönna Ecomuseum. Run by the association «Jena 1806» e. V., the Neuengönna ecomuseum is dedicated to «peasant customs », «regional history» and «the battles of Jena and Auerstadt in 1806». This latter part of the exhibition is dedicated to the arms and equipment of the armies that fought here, as well as interesting objects found on the battlefields. The association not only manages the museum, but has also organised the restoration and maintenance of the monuments on the different battlefields of the area for many years. In this context, it initiated the creation of many information panels and commemorative monuments. Furthermore, the association «Jena 1806» e. V. is dedicated, in association with many German and international partners, to the re-enactment of the events of 1806. The Napoleon Route links the historic battlefields of Jena and Auerstedt. The Route begins at Jena and leads you on to Hassenhausen and Auerstadt via Cospeda, Vierzehnheiligen, and Kapellendorf. You can consult information panels at the principal points that explain the story of these two battles. Along the main route, you can also discover a complete network of smaller paths and routes that allow visitors to come into contact with the countryside and the history of the battlefields, whether on foot, cycling, or in a car. The lines follow the precise movements of the troops who fought here, while the different stopping points bear the names of the respective French and Prussian commanders. 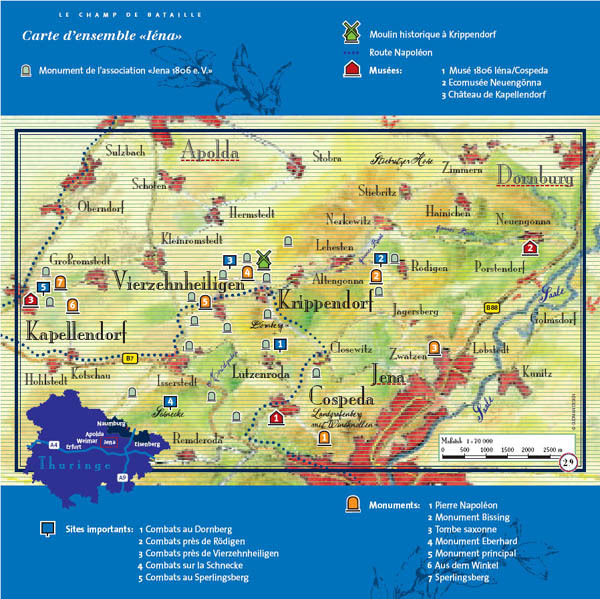 The Route named after Davout follows the path of the IIIrd Army Corps of Marshal Davout on the battlefield of Auerstedt. Setting out from Naumburg via Bad Kösen, the Marshal Davout Route rejoins the Napoleon Route at Hassenhausen. The Prussian general set out with his cavalry from Hassenhausen on a reconnaissance mission to assess the strength of the French forces in the area. He attempted in vain to drive them back to Bad Kösen. General Morand commanded the left wing of the French troops that occupied the battlefield between Hassenhausen and Bad Sulza and advanced in the direction of Auerstedt-Eckartsberga. General Friant commanded the French troops on the right wing that struck the Prussian front lines from behind and forced them to retreat. This division advanced by the North from Hassenhausen, toward Eckartsberga. The Duke of Brunswick, commander in chief of the Prussian army, led the main body of the army, based near Auerstedt, onto the battlefield of Hassenhausen. It was here that he was severely wounded. The King of Prussia, Frederick William II, was commander in chief of the Prussian Army. But he delegated this responsibility to the Duke of Brunswick. The King took part in the fighting, and so became a symbol of the decline of the ancient Prussian State. In his flight he passed by Auerstedt, and toward Liebstedt. Marshal Lannes’ army corps was the first French force to arrive at Jena, where it occupied the Landgrafenberg, a vital strategic position. It was here that Napoleon conquered the Dornberg on the day of the battle. It was the highest point on the battlefield, and so played an important part in his victory over the Prussian Army. Lannes’ troops formed the heart of the French Army. Marshal Soult’s corps d’armée formed the right wing of the French forces that mounted the heights via Wenigenjena and the Rau valley. They forced the Prussian outposts near Rödingen, commanded by General Von Holtzendorf, to retreat. Soult’s troops smashed through the Prussian lines in the fighting around Vierzehnheiligen in the place known as the Krippendorf windmill, making an enormous contribution to the Prussian defeat. The corps d’armée under the orders of Marshal Augereau formed the left wing of the French troops. Advancing out from the Mühltal, he was obliged to fight the «Schnecke», Saxon troops on a hill at the end of the valley. Other attacks were launched against the village of Isserstadt. Marshal Ney’s troops, posted in the heart of the fighting around Vierzehnheiligen assaulted the German lines between Krippendorf and Isserstadt. At the beginning of the battle, the Prussian outposts around General Von Tauentzien were posted in the area of the Dornberg, a vital strategic position, and in the villages of Closewitz and Lützeroda. Napoleon had decided to attack the Dornberg first, and it was here that the battle of Jena began. After their defeat, Von Tauntzien’s forces withdrew behind Krippendorf. The Prince of Hohenlohe commanded part of the Prussian army near Jena. Commanding from his headquarters at Kapellendorf, he faced the French troops that had occupied the Dornberg. Hohenlohe commanded in person during the fighting, that ended in defeat near Vierzehnheiligen. He fled toward Weimar under the protection of a battalion of Saxon infantry Aus dem Winkel. The Prussian troops under General Von Holtzendorf formed the outposts intended to protect the headquarters near Kapellendorf. Holtzendorf was defeated by Marshal Soult’s troops near Rödigen and Lehesten. His units withdrew toward Stobra and Apolda and took no further part in the fighting. General Von Rüchel commanded another part of the Prussian army, that found itself near Weimar on the day of the fighting. Answering Prince Hohenlohe’s calls for help until late in the day, he arrived on the battlefield at Kapellendorf too late to influence the course of the battle. Rüchel’s troops were defeated at Sperlingsberg near Kappellendorf. On the night before the battle, the Saxons, allied to the Prussians, had set up camp near Hohlstedt. When the fighting began, they were positioned around «An der Schnecke» and Isserstadt, in order to cover the attacks from the Mühltal. They were beaten by Augereau’s corps and taken prisoner. Marshal Bernadotte’s Route follows the Saale cycle path, linking the battlefield of Jena and Auerstedt. It crosses the area through which the French troops under Bernadotte passed. Bernadotte, jealous of Davout, refused to obey the orders given by the Emperor that obliged him to support Davout’s heavily outnumbered corps. Due to the incompetence of their commander (who narrowly avoided being court-martialled afterwards) Bernadotte’s corps took little part in the fighting until the the day after the battles of Jena and Auerstadt. It was at Dornburg that part of the reserve cavalry commanded by Marshal Murat arrived on the battlefied of Jena. Their intervention was one of the main reasons that balance of the fighting swung in favour of the French. Here are some other sites linked to the twin battles of Jena/Auerstedt. They do not constitute a route in themselves but give details concerning various sites in Thuringia in general. Visiteurs to the «1806 Museum» at Cospeda can also experience an interactive walk in the Emperor Napoleon’s footsteps. Headphones and walkmen are available in the Museum. The « Saxon Tomb », 200 metres south of the church at Zwätzen, is at the Southern end of the old command centre park in the Zwätzen quarter of Jena. When fighting began near Rödigen, Von Berlepsch organised the installation of a military hospital in the command centre. 47 Saxon soldiers who died of their wounds were buried in the little wood at Zwätzen, and it was in remembrance of them that August Von Berlepsch donated the monument known as the “Saxon Tomb”. An inscription bearing the names of the fallen was placed in 2005, making the “Saxon Tomb” the only monument on the battlefields of Jena-Auerstadt that bears the names of private soldiers and not only those of officers. Eckartsburg: Built by Ekkehard I of MeiBen in 998 to protect his empire. Today, the keep houses a diorama that reconstitutes the battle of Jena-Auerstadt with over 6000 lead soldiers. Visitors can also discover the turbulent history of the castle in the museum. The town of Erfurt: The capital of Thuringia has many souvenirs of the passage of the Great Army, starting with the former governor’s residence, Regiestrasse 73, built between 1711 and1720 according to plans by the architect Maximilian Von Welsch. It was the seat of the governor of Mainz and today houses the Chancellory of Thuringia. It was here, in the audience hall of the former imperial palace, that Napoleon met Goethe, on the 2nd of October 1808. The imperial hall, 15/16 Futterstrasse, is part of a building that was built in 1715 as a ballroom for the University. During the famous Congress, the Comédie Française gave a performance here. The building, now a conference centre, hosted the meeting between Napoleon and Tsar Alexander I, the 27th of September 1808. On the square of the cathedral, you can see the «Zur Hohen Lilie» House, one of the oldest inns in Europe. Since 1341, the inn has welcomed such famous names as Martin Luther or the king of Sweden Gustavus II Adolphus. During the Napoleonic era, French soldiers lodged here, as did the king of Westphalia, the youngest of Napoleon’s brothers. The splendid ensemble formed by the cathedral and church of St Severi is not to be missed, as a stunning example of medieval religious architecture. The late gothic style of the cathedral and the elements of flamboyant gothic are striking. In the centre, visitors can find the oldest medieval bell in existence, which, together with the church of St Severi is the town emblem. At the beginning of 1814, French troops fell back via the lower cathedral hill and the Petersberg. Lastly, the Petersberg citadel is the only baroque citadel in Europe still conserved today. It dates from the period when Efrurt belonged to the kingdom of Mainz, and reflects the European military architecture of the era. During the French military occupation (1806-), the citadel became the theatre of various military operations and was the last bastion of French troops in 1813/1814. The town of Weimar, although primarily marked by the poets Goethe and Schiller and the intellectual effervescence of German classicism, keeps several places of rembrance of the Age of Napoleon. The residence and «office» of the editor Friedrich J. Bertuch, who had frequently published writings against Napoleon, and was obliged to flee Weimar for some time after the 14th of October 1806. Since 1955, the house is home to the principal museum, at n°s 5-9 Karl-Liebknecht Street. At n° 23 Frauentor Street, you can discover the famous inn Gasthaus zum weiBen Schwann. A cannonball fired in October 1806 is still embedded in the south wall. Goethe&#8217;s house on the Frauenplan is just next door. Further away, you can see a life-size bust of J. D. Falk, deposed here in 1913 in the trench in front of the building society. In 1806 Falk had effectively rendered great services to the town by serving as an interpreter and mediator with the French, although the monument was first and foremost set up to honour Falk&#8217;s social engagement in helping orphans of the campaigns of 1813/15. Finally, on the southern side of the church of St Jakob, there is the tombstone of Melchior Kraus. This painter and drawing professor, nearly seventy years old, died on the 5th of November 1806, following the damage caused by pillagers and from sorrow at losing his workshop. The museum of Romantic Literature, am unteren Markt, Jena, is dedicated to Jena romanticism. The building was in fact the former home of the philosopher J. Fichte, who at one time taught in Jena. The museum concerns all the personages and esthetic, artistic and philosophical schools of thought of the period. It represents a good introduction to the discovery of the great cultural events at the end of the 18th and of the 19th century in the area of Weimar and Jena. Schiller’s garden pavillion, SchillerBächen 2, Jena. This pavillion, bought by Schiller in 1797, was one of the residences of the poet and University professor. It was here that Schiller wrote some of his works, including his famous Wallenstein trilogy. The museum, carefully renovated, belongs to the University, and still gives off the spirit of the place. Goethe’s “garden pavillion II” nestles in the idyllic Tuscan thermal park in the town of Bad Sulza. It is an identical copy of the original at Weimar. Open to visitors in a new setting, and faithful to the spirit of Goethe, it is even possible to spend the night here. The visit to Goethe’s house, n°1 Frauenplan, brings us into the world of this great German author. The house, in the baroque style with a garden, was built in 1709. The poet, statesman and scientist Goethe lived here during nearly 50 years until his death in 1832. The permanent exhibition in the adjacent National Goethe museum presents the various aspects of Weimar classicism. Goethe’s garden pavillion, in the park near the Ilm, is also an attractive place to visit. Johann Wolfgang Von Goethe moved into this small house a few months after his arrival in Weimar. He lived and worked here until his move to the house on the Frauenplan in 1782. A walk in the park by the Ilm is an excellent way to discover this pavillion. Schiller’s house is another of the sights of Weimar, n°12 Schiller street. It was in 1802 that Friedrich Schiller bought the late baroque townhouse (built in 1777) on the esplanade at Weimar. He lived here with his family until his death in 1805. Here he wrote “The fiancée of Messine” and “William Tell”, as well as fragments of “Demetrius”. Contains a princely crypt, the tomb of the local princes, built between 1824 and 1827 on the orders of the grand-duke Charles-Augustus. It houses the tombs of Goethe and Schiller. In 1860/62, a Russian Orthodox chapel was added to the princes crypt, which houses the tomb of Maria Pavlovna, daughter of the Tsar and grand-duchess. The palaces in Dornburg, Krehenstrasse 2, are remarkable on several accounts. In fact, the Renaissance palace was built in the 16th century as a residence, and renovated in the 19th. It serves as a place of remembrance in memory of Goethe’s stay here in 1828. The rococo palace was built in the 18th century as a summer palace for the duke Ernst-Augustus of Saxe-Weimar. The old palace is mentioned in 10th century documents, as an imperial palace for the emperor Otto, that today serves as a meeting-place. 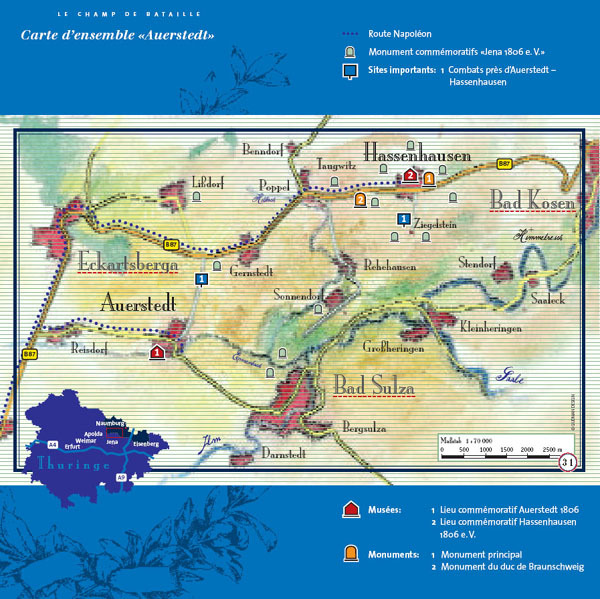 It is possible to discover History in an original atmosphere, thanks to the Thuringian Ecomuseum at Hohenfelden. The museum is lodged in authentic historic buildings from the 17th, 18th and 19th centuries. The thirty museum-buildings include shepherd and farmhouses, barns, workshops of Thuringia, reconstituted in the museum. The Leuchtenburg, Dorfstrasse 100, Seitenroda. The queen of the Saale valley, this 13th century castle built on the Leuchtenburg (with a museum) deserves a visit. The exhibition is dedicated to the Middle Ages, the history of the area, and porcelaine. Johanistor und Pulvertum, Johannistrasse, D-07743 Jena: this ensemble of medieval ramparts and imposing towers is a reminder of the historic defensive works of the town, composed of walls with a walkway, moats, gates and towers. Moreover, from the heights of these towers, a superb panorama awaits you. The principal museum of Jena, Markt 7, D-07743 Jena. Situated in one of the oldest townhouses in Jena, the museum welcomes visitors with the “seven miracles of Jena”. You can also see the banner of the guild of students of Jena, the flag of the Wartburg. The gallery presents exhibitions of modern art and of the history of Jena. The protestant convent of the Augustinians, D-99084 The church and convent of Augustinian hermits were built around 1300. Martin Luther entered here on the 17th of July 1505, and an exhibition “Bible-convent-Luther” is dedicated to him. Since 1998, the convent serves as a rallying point for demonstrations and oecumenical reunions, as well as a memorial in memory of Luther. Church of the palace of Eisenberg, Burgstrasse 1, D-07607. The baroque church, with an altar and organ Donat-Trost, is one of the most exceptionnal sacred edifices in Thuringia. It is also a typical example of a protestant church, “baroque Theatrum sacrum”. At the foot of the church, there is a herb garden and a tea room. Kunsthaus Apolda Avantgarde, Bahnofstrasse 42, D-99510 Apolda This museum has acquired a great reputation in Germany thanks to its exhibitions. Art lovers appreciate the unique character of this building with its large – but intimate, rooms, which allow you to savour the works on display in their integrity. Naumburg Cathedral Domplatz 16/17, D-06618 Built in the early gothic style, St Peter und Paul is the most famous symbol of Naumburg. Castle of Neuenburg, Schloss 1, D-06632 Freyburg The oldest castle of the landgraves of Thuringia was built in 1090. The castle later became the residence of the prince elector and a hunting lodge of the dukes of Saxe-WeiBenfeld. The double Romanesque chapel is one of the unique features of the castle. Ruins of the Convent of Memleben, Volkmar Kroll Strasse 22, D-06642 Memleben In the the tenth century, Memleben became one of the most important imperial palaces of the Ottos. The first German king Henry I and his son, the emperor Otto I stayed here on many occasions, and it was here that they died. The remains of the Romanesque convent were excavated in the 13th century and the crypt is almost entirely preserved. The Rudelsburg, Burgstrasse 33, D-06628 Bad Kösen/ Saaleck The castle, mentioned for the first time in 1172, is the most famous castle of the Saale area, built to protect the valley and its ancient trade route. The baroque palace was built between 1657 and 1678 as a residence for the dukes of Saxe-Zeitz. The baroque cathedral is located in the heart of the palace, and the oldest part of it, the Romanesque crypt, is one of the oldest in Germany. Opening times: April to November, Wednesday to Sunday, from 10am to 1pm and from 2pm to 5pm; from December to March, Wednesday to Sunday, from 9am to 1pm and from 2pm to 4pm. Also open on Easter and Whit Mondays. Institut zur militärgeschichtlichen Forschung Jena 1806 e. V.
Castle grounds: every day from 9am to Midday. Castle museum: Tuesday to Friday, from 9am to Midday and from 1pm to 5pm, Saturday and Sunday, from 10am to Midday and 1pm to 5pm. Opening times: from Tuesday to Sunday, from 10am to 4pm. The philosopher lived here for 50 years, from 1782 to his death in 1832. Nearby museum. He lived here until 1782. In 1806, Falk served as the imperial translator and intermediary with the French. He also took care of the orphans resulting from the War of Liberation, 1813-1814. Built between 1711 and 1720, this construction was the seat of the governor of the kingdom of Mainz. It was here, in the audience hall of the ancient imperial palace that Napoleon met Goethe on 2 October 1808. During the Congress of Erfurt in 1808, the Comédie française gave a performance which was to be remembered long afterwards. This inn not only housed Napoleonic soldiers but also Jerome Bonaparte, King of Westphalia. Late example of Central European Baroque military architecture, this citadel was the theatre of several military operations during the French occupation in 1806, and was later to become the last refuge of French troops in 1813-1814.